Click here to subscribe to “Session Watch” and receive weekly updates during the Legislative Session! 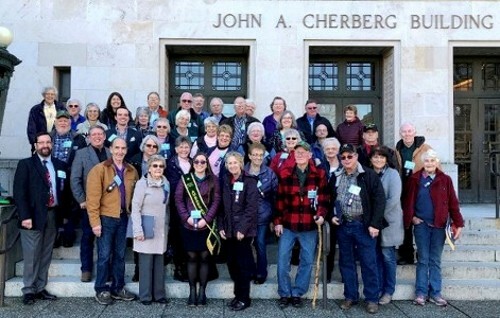 The Washington State Grange is a nonpartisan, grassroots organization. The Grange does not limit any member's freedom to think, believe or vote as he or she pleases. However, we always give full support to good legislation that betters the lives of our members and all Washington citizens. Involvement in the legislative process has been an important aspect of Grange activity since the organization’s inception in 1867. Our primary legislative objective is to represent the views of rural residents and the agriculture community. Our views become Grange policy from the grass roots, through a “bottom up” democratic process. Each year our policies are summarized and published in the Legislative Handbook, which guides our work in the Legislature. We encourage all Grangers to get involved and make their voices heard. DAY WAS A GREAT SUCCESS! Get Leg Day Agenda Here! Unlike all other fraternal groups, involvement in the legislative process has been an important aspect of Grange activity since the organization's inception in 1867. As a community-based organization, the Grange is a natural arena for discussion of local and national issues. Grangers assembled for their subordinate and Pomona meetings debate matters of common concern. Topics range from the need for a local traffic signal to school levies; from nuclear disarmament to hunger relief in Third World nations; from public power to state and national social programs. After debate, the Grange members draft and vote on a resolution concerning the issue. If the problem is a local one, the Grange officers and legislative committee members often pursue solution options such as visiting local government officials, writing letters or testifying at hearings. Resolutions covering issues of statewide or national concern are forwarded from the subordinate Grange to the State Grange. Eventually, the resolution is brought to the delegates assembled for the State Grange convention, usually held during the third week in June. Committees discuss it and delegates debate it. When adopted, it becomes State Grange policy. The resolutions passed at the State Grange convention that concern national matters are referred to the National Grange convention for consideration. Resolutions adopted there become National Grange policy. In Washington state, representatives of the Grange are present in Olympia during legislative sessions to explain the Grange policy as it relates to bills under consideration. The Grange also prepares and presents testimony to various commissions and at special hearings throughout the year.